The Sekulula VAT Easy programme aims to simplify the process of paying Swaziland import VAT on goods purchased from South African VAT registered vendors; it is open to all Swaziland residents. Commercial importers based in Swaziland who purchase goods in cash from VAT registered vendor in South Africa. Importers who are registered with SARS as an importer/exporter. NOTE: Click here for information on how to register with the South African Revenue Services (SARS). Important Note: The Swazi importer should nominate a South African agent registered by SARS. This could be a SARS clearing agent. Any Swaziland resident who has purchased goods from a VAT registered vendor in South Africa. Individuals importing goods for own use and not intended for re-sale, gifts, exchange or any other commercial activity; such goods are classified as Commercial declarations. Pay the VAT due when purchasing goods from a VAT registered vendor in South Africa. Cite the Swazi importer as “exporter” when completing the declaration forms for both South African and Swaziland Customs. Proof of payment for purchases above E10, 000.00. SRA Customs officials will check the submission to ensure that it meets all procedural requirements; once satisfied that all is in good order, the declaration will have been completed and you may take your goods home without having to make any payment. It is not a requirement that the invoices and goods being imported be presented South African Customs for purposes of Sekulula. SARS may however randomly request that they be presented to them. For purchases worth more than E10, 000.00, also submit a proof of payment with respect to such purchase. 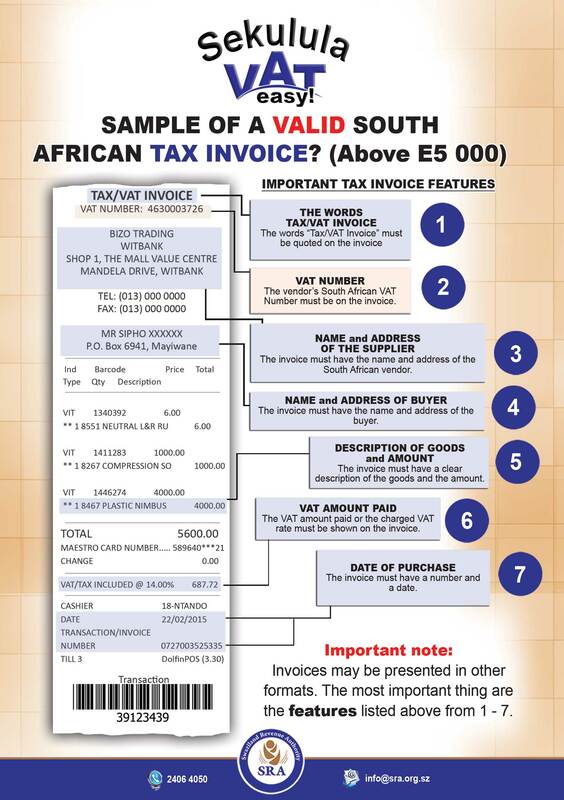 FEATURES OF A VALID SOUTH AFRICAN TAX /VAT INVOICE? The words “Tax Invoice” or “VAT Invoice”. An invoice number and date. The name and address of the South African vendor. The vendor’s South African VAT Number. A clear description of the goods purchased and the price charged for each. The VAT amount or rate (in %) charged to the purchase. Important note: Invoices in excess of E10, 000 must have proof of payment. If any of the above is not adhered to, the attending SRA Customs Officer will reject the declaration for Sekulula/VAT Easy purposes. VAT is not paid twice – VAT paid in South Africa on purchase of goods will be claimed by the SRA on behalf of the importer of the same goods; the refund received will be used to pay the VAT that would ideally have been paid when importing the goods into Swaziland. The incentive of not having to pay anything when importing goods into Swaziland is envisaged to encourage importers to declare goods purchased in South Africa on which VAT was incurred. This will increase the country´s VAT and SACU revenues. For convenience, collect a VAT Refund Envelope from SRA Customs before leaving Swaziland. Non-commercial importers are advised to collect the Personal Baggage Declaration form (Form E) and complete it before returning to Swaziland. 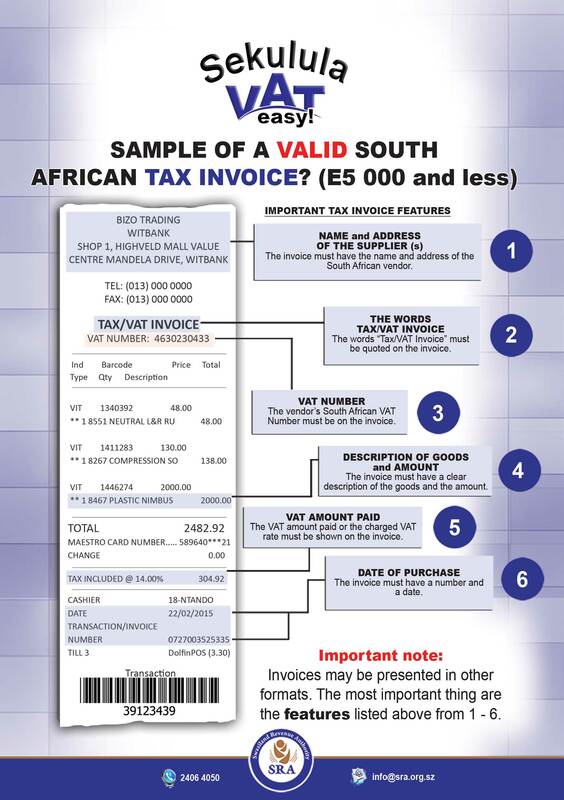 Where an importer may need the tax invoice, for warranty, guarantee or booking keeping purposes, request that the South African supplier issues a duplicate or make your own copy. Request the South African supplier to include the importer’s name and address for invoices in excess of R5, 000. Confirmation that full payment has been received with respect to the purchase, printed on the Tax/VAT invoice. The goods must be brought into Swaziland no later than 90 days from the date of invoicing. Swaziland VAT registered vendors, with full deduction rights may claim the VAT paid in South Africa as input tax on their return. Such importers are advised to maintain SRA endorsed invoices for record purposes. Goods imported through non-commercial border posts (all those that have NOT been listed above) and the airports. Declare goods and pay import VAT on entry. The importer’s bank details as shown on the remittance form must be endorsed/confirmed by the relevant bank. Submit claim documents to SRA within 60 calendar days from date of invoice. For goods bought on credit (regardless of the value) the claim must be accompanied by proof of payment. Claims are forwarded to SARS for processing and payment. Claims with respect to motor vehicles and second hand goods are subjected to an audit by SARS prior to issuance of the VAT refund. The VAT refundable on second hand goods MAY be below the VAT paid. Upon receipt of the refund from SARS, SRA immediately remits the amount paid into the importer’s bank account.